Caption slip reads: "Photographer: Richardson. Date: 1951-10-03. Reporter: Swaim. Assignment: Ant paste. 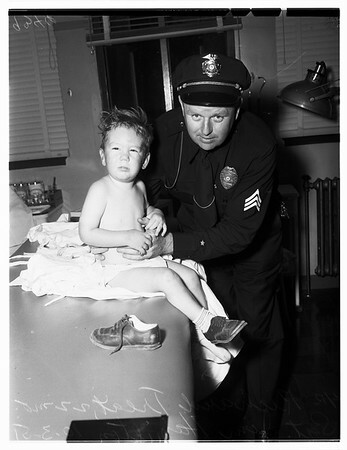 K15, 16: Richard Treat (cq), 22 months, being told off by burly Sergeant Jim Hamilton, Pasadena police, after Richard had 3rd ant paste stomache pumping in emergency hospital since Aug. 28".